A US top nuclear envoy visited South Korea on Saturday, days before the leaders of the two Koreas are set to hold a summit meeting next week. 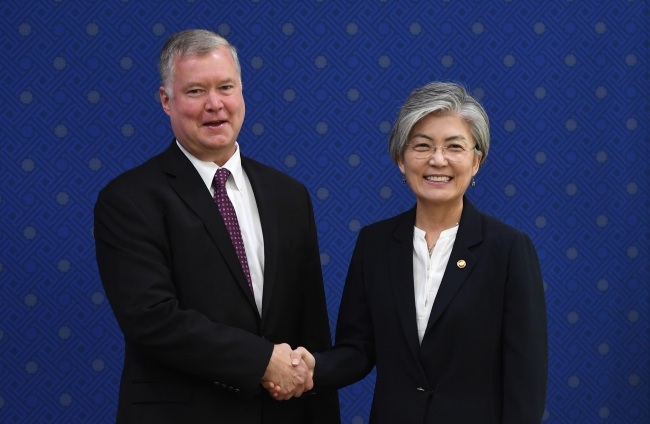 Stephen Biegun arrived in Seoul, following his trips to Beijing and Tokyo where he met with his counterparts. He is to meet key officials in South Korea during his two-day stay here. This marks his second trip to Seoul in less than a week. The former Ford Motor Co. executive made his first trip to Seoul early this week since his inauguration during which he paid a courtesy call to President Moon Jae-in and held meetings with officials, including Unification Minster Cho Myoung-gyon and Seoul‘s top nuclear envoy Lee Do-hoon. He came to Seoul again days before Moon and North Korean leader Kim Jong-un are to meet in Pyongyang for their third summit meeting, which is expected to focus mostly on denuclearization and inter-Korean relations.